There are many of you who want to travel deeper down the rabbit hole. Did you know science knows that within our heart chamber is a spiraling energy? Heart surgeons learned the hard way that if you tried to cut this spiraling energy with a scalpel it would kill their patient. For many of us learning how to deal with stress and the daily challenges are not enough. We have questions on why we are here and what is my purpose. So many of us like me knew they came here to do something, something of value and purpose. But we have found that our mind has other ideas. So, it is the basic HeartMath work that prepares us and is the precursor to finding out what our true hearts purpose is. We have learned by doing the HM techniques that we have made room now for our heart to speak! Learning the difference between the voice of the heart and the voice of the mind is a skill needed to successfully navigate life. We have shut off the incessant chatter of our mind and the ego attached to it and are now able to truly explore what it is we came here to do. So many of us feel like a Jack-of-all-trades and master of none. Sounds familiar. That’s because those ideas were not part of our greater good. There are things out there that would stop us from fulfilling our missions. So, in the beginning HM work we learned how to shut them off by rising our vibration by living in compassion, love and appreciation. Did you know that in that sacred spiraling energy within the heart is also the door to our Akashic Records and the Akashic Records of the whole Universe? If you could truly learn how to connect with that sacred space, the world would be at your fingertips. You could manifest your hearts true desires! 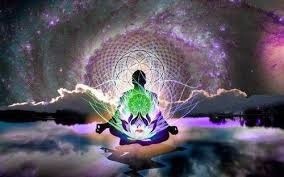 If you are here well then you are well of aware of the teachings of the Ascended Masters. This is their secret and it wasn’t until the last few decades they have wanted to let this secret become mainstream. The indigenous peoples; Aborigines, Native Americans, Shamans, Wise Women, were the first to receive this information. And so, what we are really doing here is training to become like an Ascended Master. How fascinating is that! Now that is really going down the rabbit hole. And this is all part of the Great Shift, our Ascension to higher dimensions that is so prevalent in our world today. So many of us are ready now to step into our roles to help humanity evolve. And with this work many of us will do exactly that. You are not required to do this of course but just being able to weed out the confusion and tire spinning of our daily decision making as to who or what we are and want to do with this life will be that much easier. Not to mention really amp up or joy of life and our relationships. Being in love with ourselves, our planet, and fulfilling our hearts true mission is a dream that is attainable. Please contact me if interested in this. There are thousands of Ascended Masters, not just what is pictured.